More than 100 area Veterans were honored at a breakfast hosted by Fremont Lodge No. 15 on Saturday, February 27. Worshipful Master Grady Wells and a host of brothers, with the help of area Job’s Daughters, thanked the vets for their service. The free event included patriotic flag presentations, lots of fellowship and extended knowledge of the lodge in the community. Good publicity in the newspaper and local radio brought in many of the area’s vets. Additional honor breakfasts are planned throughout the year. Here the brethren gather during a break in the action. Brother Ed Nolte, Vice President of National Sojourners, Inc., presented several flag talks to the appreciative crowds of veterans at the event. Fremont veteran Ron Vlach set up a “missing man” table to commemorate our fallen service men. 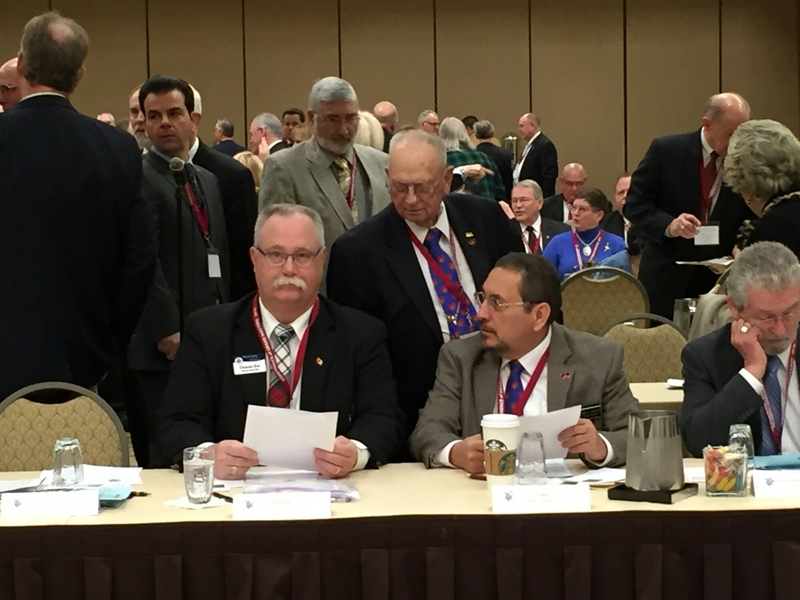 Pictured are the Nebraska Grand Lodge officers and others who attended the Conference of Grand Masters of Masons in North American in Madison, Wisconsin. The Grand Lodge of Nebraska will be the host of the conference in 2017 in Omaha. Representatives from all 50 states and Grand Lodges around the world attend the conference each year to network and learn from what other Grand Lodges are doing in Masonry. Miss International Job’s Daughter Sarah Leeper and Nan Rix, Lady of the Grand Master, about to enjoy their desserts. Grand Master Dennis Rix awaits the start of the opening session of the Conference of Grand Masters. The Grand Master and his lady and the Grand Secretary enjoying the tailgate party at the Conference of Grand Masters in Madison, WI. Madison, Wisconsin…here we come. The Grand Master and Grand Junior Warden are catching up on their beauty sleep for the busy weekend. Left: MW Dennis Rix autographs a Circus Souvenir Program for a young fan. Right: MW Dennis Rix on the left and Tangier Potentate Ill Sir Charlie Marchand on the right with two real clowns between them. Deputy Grand Master Rick Myers enjoyed Valentine’s Day breakfast at John J Mercer Lodge No. 290. Pictured are Brothers David Kipp and Jonathan White, preparing for the next wave of hungry diners.